Ideal for wet or dry hair, this Divine Styling Potion conditions, eliminates frizz, adds shine, seals ends and smooths flyaways. Ideal for all hair types. Protects against thermal damage and is humidity resistant. Free of gluten, parabens, phthalates, iron oxides, nut ingredients, palm oil and 100% Vegan. Cruelty free. After shampooing and conditioning with Saints & Sinners Shampoo and Conditioner, apply Saints & Sinners Divine Styling Potion throughout damp hair and style as desired. Use on dry hair to smooth flyaways and for additional shine, separation and condition. SAINTS & SINNERS IS AMAZING! I ALMOST FEEL LIKE IT HAS BEEN A FOUNTAIN OF YOUTH FOR MY HAIR. THE LEAVE-IN CONDITIONER IS LITERALLY A MIRACLE AT HOW EASY IT IS TO COMB THROUGH MY HAIR, REMOVING TANGLES WITH MIRACULOUS EASE…I USE THE MASQUE ABOUT ONCE A WEEK AND IT IS AMAZING HOW EVEN SEVERAL DAYS LATER I AM STILL HAVING SMOOTHER HAIR WITH MUCH LESS FRIZZ! I ALSO USE THE VELVET STYLING POTION AND USE MUCH LESS HAIRSPRAY BECAUSE MY HAIR JUST LOOKS GOOD AND STAYS BETTER! 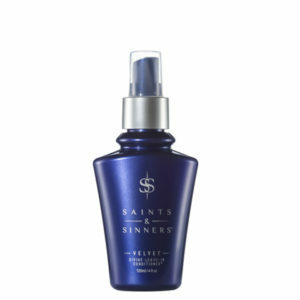 I HIGHLY RECOMMEND THE SAINTS & SINNERS LINE OF PRODUCTS! 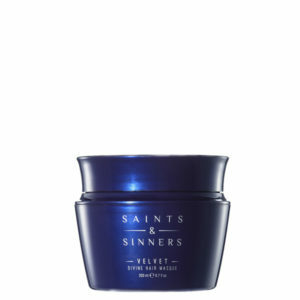 SAINTS AND SINNERS IS NOT LIKE ANY OTHER PRODUCT I HAVE EVER USED ON MY HAIR. IT’S TAKEN MY OLD, TIRED HAIR AND MADE IT ABSOLUTELY YOUNG AGAIN! INCREDIBLY SOFT AND SHINY. THE SHAMPOO AND CONDITIONER ARE A MATCH MADE IN HEAVEN AND I USE THE THE STYLING POTION BEFORE I FLAT IRON, TOTAL GAME CHANGER!!! I LOVE THE STYLING POTION!! This multipurpose potion works magic! It seals ends, smooths strands and leaves hair shinier than ever before. Used as a thermal primer before blow-drying or on finished styles to zap away frizz, this lightweight cream styler delivers shine, softness and a salon-worthy scent that lasts for days. Plus, it's formula is free of gluten, parabens and phthalates, meaning it won't strip of fade your colored strands. I like to use the velvet divine styling potion on dry hair. It's great for anti-humidity and frizz control as well as smoothing. It is a universal product and works great on fine hair and thick hair. I even have male clients who love it as a dry styling cream. My fav go to!!! Smells so good too!! 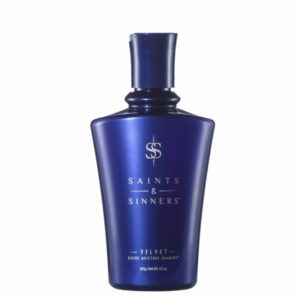 All saints and sinners smells so good! One of my favorite products…use it on almost every client!